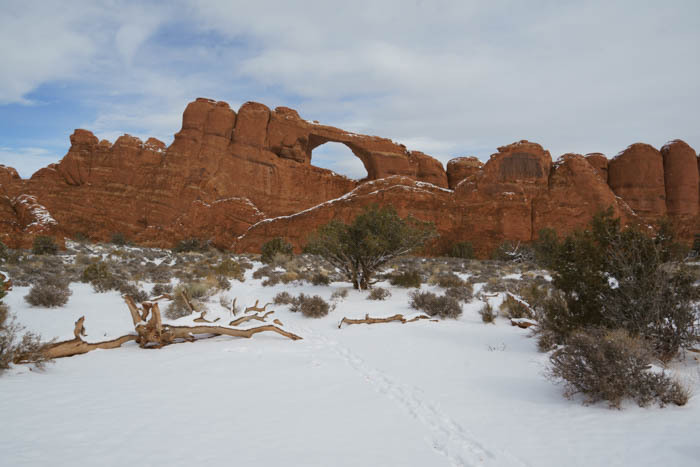 Plenty of people visit Arches National Park, but very few visit during the winter months. I understand it’s not the most convenient time of year to venture out into the remote Utah desert. 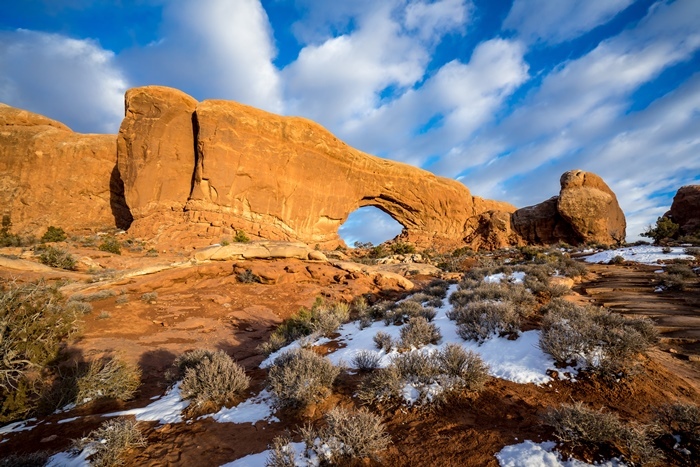 But, when you visit Arches National Park in winter, you get a chance to see an entirely different park, possibly covered in snow, with spectacular sunsets and crowd-free trails. So if you go, what can you see? Let’s take a look. Arches National Park is located near Moab, in east-central Utah. 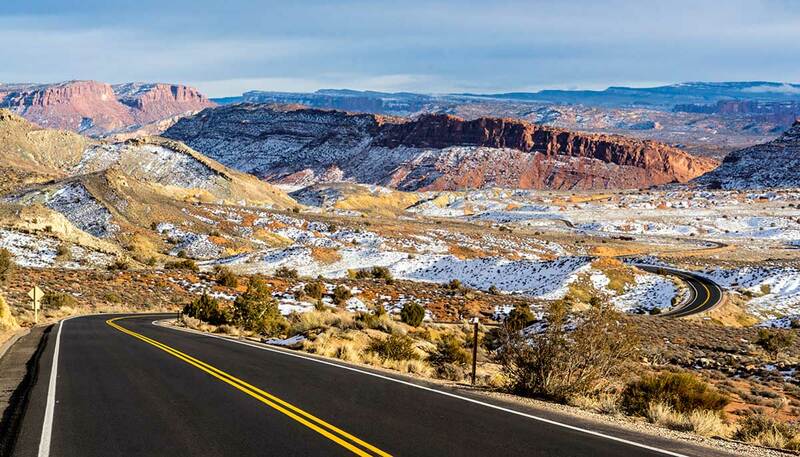 From Moab, drive north on US 191 and use the park’s only entrance, 4.7 miles north from the center of town. I arrived in Denver on a Saturday in late January 2018, and spent Sunday racing across the mountains to get to Moab by the end of the day. The reason? 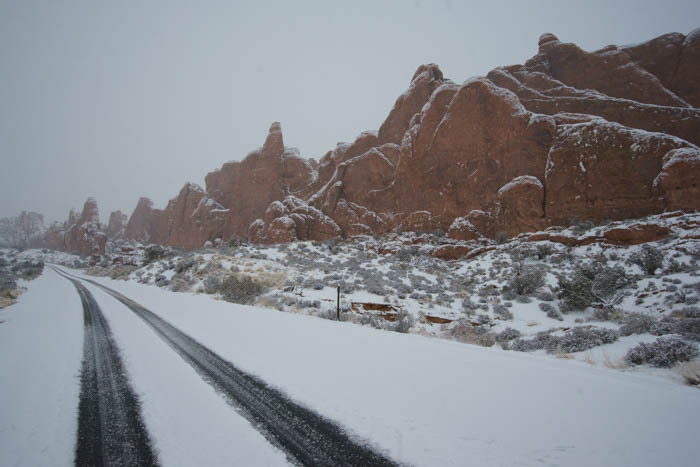 Snow was in the forecast, and I wanted to see it fall in Arches, rather than be stuck in the middle of the Rocky Mountains on Interstate 70 during a blizzard. Fortunately, my timing was perfect, and on Monday morning I awoke (a couple of hours before sunrise) to see snow falling from the sky. I drove into the park during the “blue” hour, something my pictures can confirm. There wasn’t much light, but I had a great time at Balanced Rock, one of the first big attractions that tempts you to stop as you drive up Arches’ scenic drive. At this point, it was still snowing. The forecast called for a few hours of snow, followed by clearing conditions (which is why I got up early – I didn’t want to miss it!) I was definitely the only person hiking around Balanced Rock, and probably one of just a dozen people in the entire park. The silence enveloped me. It was wonderful. As daylight grew, everything went from blue to, well, normal. I was following some tracks through the snow, as I made my way towards the Devils Garden area at the north end of the scenic drive. From the tracks, it looked like only two or three other vehicles had driven this road before me. Even though the road was snowy, it wasn’t very slippery, and I wasn’t concerned about getting stuck. The road ends at Devil’s Garden. One of the park’s most popular trails is here. 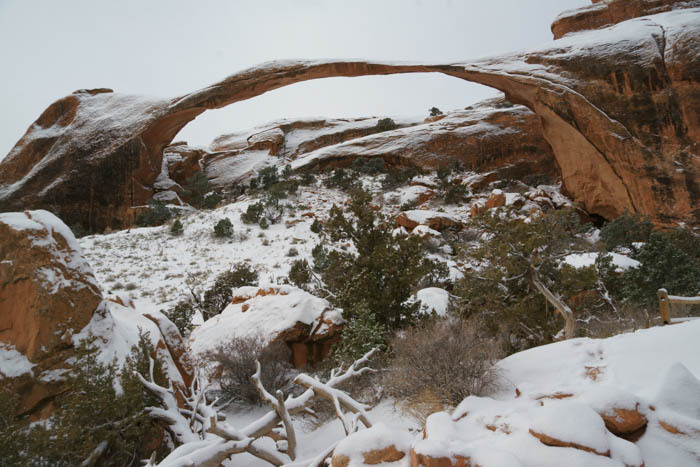 I decided I probably wouldn’t have a better chance to go for a hike in the snow, so I took the walk out to Landscape Arch. I’ll tell you more about the hike to Landscape Arch on this page. By the time I finished the hike, the sky was starting to clear. I knew the snow would start to melt as soon as the sun was out, so I picked up the pace, drove back down the park’s scenic road, and made a few more stops along the way. Only a short hike is required to see Skyline Arch. It’s just off to the side of the park road, south of Devil’s Garden. 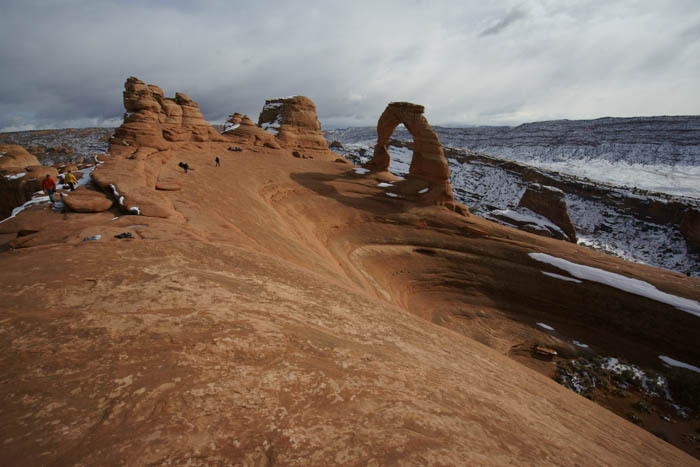 The trail takes you across the snow and around a smaller hill to a viewpoint directly below Skyline Arch. A bit further south, the Fiery Furnace is a confused jumble of passageways. It’s easy to get lost inside — which is why the park requires hikers obtain permits and strongly recommends guided tours. I’ll put that on my agenda for a future visit — for now, I was quite happy to see the rocks covered in snow. 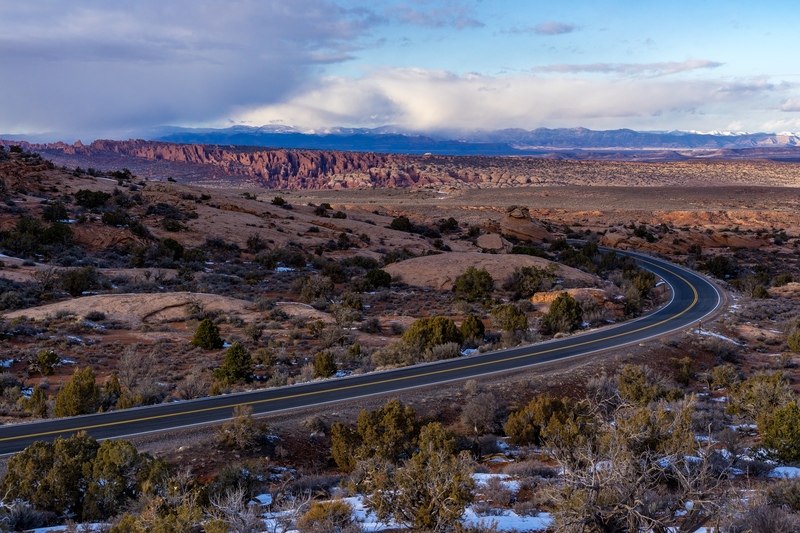 From Fiery Furnace, the road dips into the Salt Valley. There’s an official viewpoint nearby, but I preferred the view from the middle of the park road. 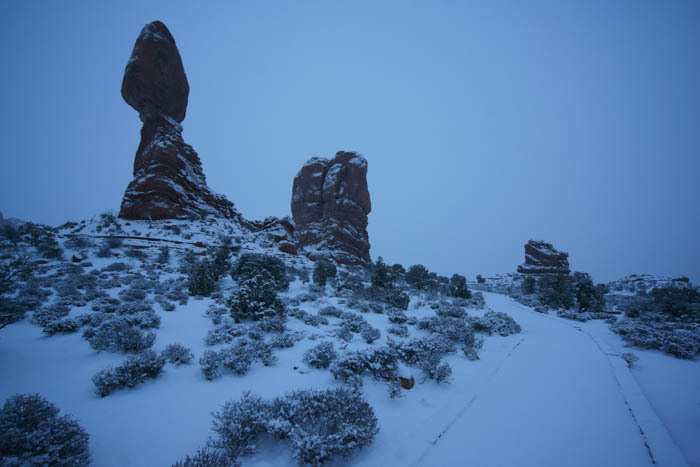 When you’re visiting Arches National Park in Winter, it’s much easier to stop in the middle of the road to take a picture. The snow was melting quickly in some spots, but I held out hope that I’d get to see Delicate Arch with at least a dusting of snow. So, my next stop as I headed south through the park was to drive out to the Wolfe Ranch area and take the hike out to Delicate Arch. As you can see, it wasn’t very snowy once I got up there. But you’ll also notice that there were only about a dozen other people up there with me. That’s something that will never happen in summer. I’ll talk more about the hike to Delicate Arch here. Just before you arrive at Balanced Rock once again, take the turn onto the road to the Windows. Before you get there, you’ll see a side-road to a parking lot at the Garden of Eden. From here, you’ll have a nice viewpoint, overlooking the road you just drove in on. Spend a few minutes (or more) scrambling around on the rocks, and you’ll find some really impressive views at the Garden of Eden. The morning’s snow had turned into puddles, which provided some great reflections of the towering rocks. Garden of Eden is a great alternative to The Windows for watching a sunset, in case you can’t find a place to park at The Windows. 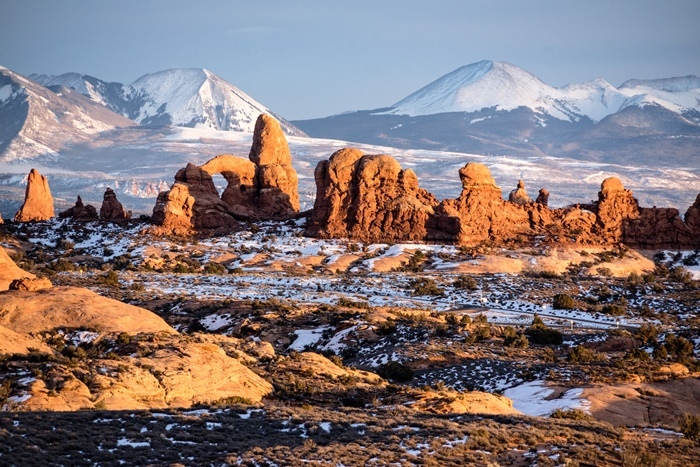 But if you’re visiting Arches National Park in Winter, you don’t have to worry about that! 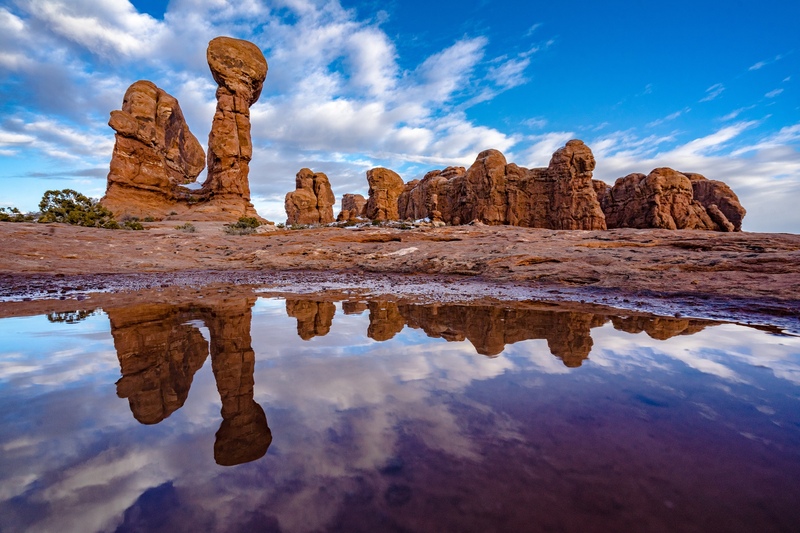 From the Garden of Eden, continue out the road to the Windows area of Arches National Park. Before you get there, you’ll have an awesome view of the area, with the La Sal Mountains providing a snowy backdrop. There isn’t a great place to park for this view, so if you want this picture, you’ll probably have to stop along the road. I wouldn’t recommend doing that in summer, but it’s not a problem in January. My parking spot at The Windows was right at the trailhead for the hike up to the North and South Windows and Turret Arch. Walk just a short distance up the trail and you’ll see this great view of the North Window, beautifully lit by the setting sun. Yes, the winter day that started with snow before dawn was ending like this. 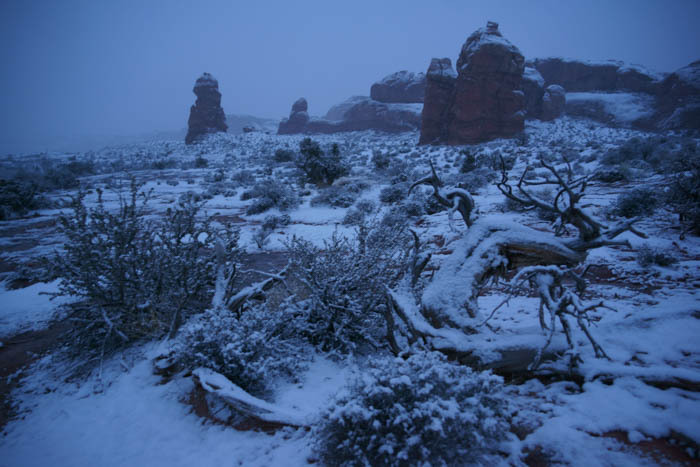 That’s the magic of Arches National Park in Winter. I’ll share more of my sunset photos around the Windows area on this page. Arches in January is Better than July. Here’s why. 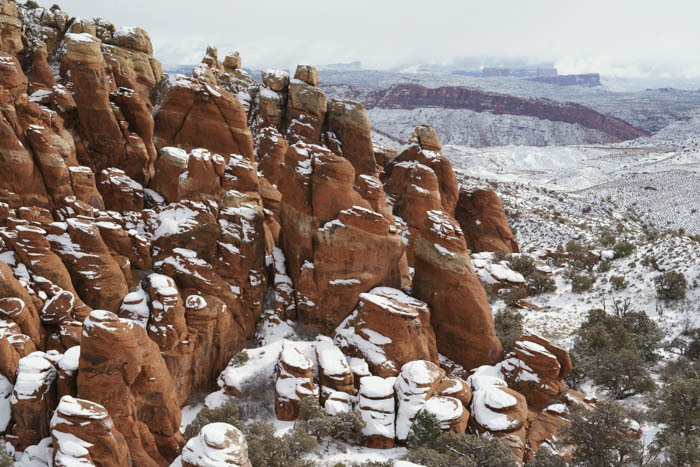 You won’t regret a visit to Arches National Park in winter. I can’t guarantee snow, but if you’re lucky, you’ll get to experience the park in a magical new way. Even if the weather is sunny, you’ll still get to enjoy some great hikes in cool weather without all the crowds.